2016 Funko Pop Clockwork Orange brings ghastly fun to the Pop! Movies line. The vinyl figures set centers on the main character with a chase variant and more potentially on the way. Adapted from the 1962 novel A Clockwork Orange by Anthony Burgess, the 1971 film garnered both praise and criticism for the use of violence and aversion therapy techniques. In fact, the film is considered one of Stanley Kubrick’s more controversial pieces of work. A Clockwork Orange is narrated by the main character — Alex DeLarge, played by Malcolm McDowell (Star Trek: Generations, Tank Girl, Heroes). Alex is by all accounts a juvenile sociopath who also happens to love Beethoven. Even though he is extremely violent to everyone, including his gang of droogs, his charismatic and unapologetic personality makes DeLarge a cult classic favorite. 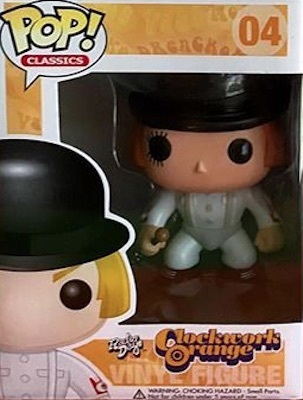 While 2016 Funko Pop Clockwork Orange initially offers just two figures, with one being a variant, they embody Alex DeLarge perfectly. The base figure features Alex with his top hat and cane, while the variant shows him masked. 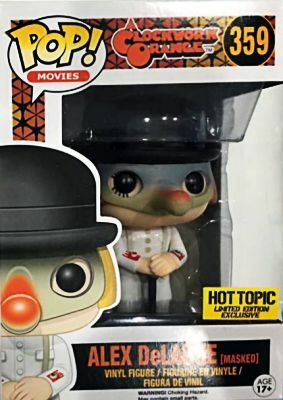 The masked variant is issued as a mystery chase and is exclusive to Hot Topic. 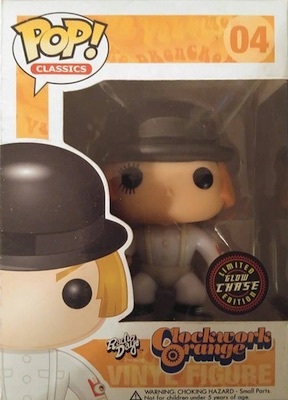 Funko has previously produced A Clockwork Orange figures in the Pop! Classics line in very limited numbers with both a base figure and glow-in-the-dark chase. The line was never officially released and it has been reported that only 12 figures for each version were made. They sell for huge amounts whenever they surface. Numbered as part of Pop! 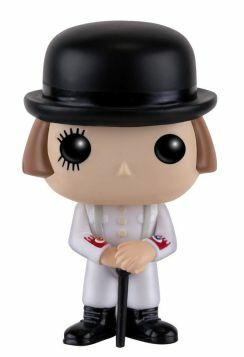 Movies, the 2016 Funko Pop Clockwork Orange vinyl figures stand approximately 3 3/4" tall.